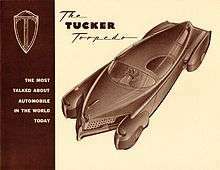 Tucker Torpedo brochure, c. 1947. This concept drawing includes a centrally positioned steering wheel, doors that wrap up into the roof, and front fenders that turn when the car is cornering. These features did not reach production. The Tucker 48 (named after its model year) is an automobile conceived by Preston Tucker and briefly produced in Chicago in 1948. Only 51 cars were made before the company folded on March 3, 1949, due to negative publicity initiated by the news media, a Securities and Exchange Commission investigation and a heavily publicized stock fraud trial (in which allegations were proven baseless in court with a full acquittal). Speculation exists that the Big Three automakers and Michigan senator Homer S. Ferguson also had a role in the Tucker Corporation's demise. The 1988 movie Tucker: The Man and His Dream is based on the saga surrounding the car's production. The film's director, Francis Ford Coppola, is a Tucker owner and displays his vehicle on the grounds of his winery. The 48's original proposed price was said to be $1,000, but the actual selling price was closer to $4,000. A 1948 Tucker sedan was featured in the July 26, 2011, installment of NBC's It's Worth What? television show. The car's estimated value at that time was US$1,200,000. The car is commonly referred to as the "Tucker Torpedo". This name was never used in conjunction with the actual production car, and its name was officially "Tucker 48". 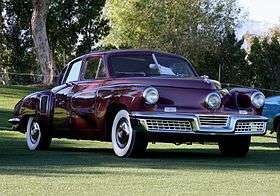 The Tucker automobile was originally named the "Torpedo," but was changed to "Tucker '48" around the time of Lawson's departure and Tremulis' arrival, reportedly because Tucker did not want to remind the public of the horrors of World War II. Alex Tremulis has claimed responsibility for dubbing the first prototype automobile the "Tin Goose," which is presently used in a loving manner but at the time was considered derogatory. The car had a rear engine and rear-wheel drive. A perimeter frame surrounded the vehicle for crash protection, as well as a roll bar integrated into the roof. The steering box was behind the front axle to protect the driver in a front-end accident. The instrument panel and all controls were within easy reach of the steering wheel, and the dashboard was padded for safety. The windshield was made of shatterproof glass and designed to pop out in a collision to protect occupants. The car's parking brake had a separate key so it could be locked in place to prevent theft. The doors extended into the roof, to ease entry and exit. Each Tucker built differed somewhat from the previous car, as each car built was basically a "prototype" where design features and engineering concepts were tried, improved, or discarded throughout the production cycle. The door releases on the interior of the Tucker came from the Lincoln Zephyr. 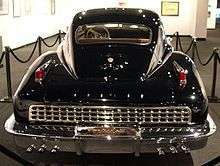 The steering columns used in the Tucker were donated by Ford and are from the 1941 Lincoln. Preston Tucker held a patent for a collapsible steering column design. A glove box was added to the front door panels instead of the more conventional location in the dashboard to provide space for the "crash chamber" that the Tucker is now famous for. This is a padded area ahead of the passenger seat, free from obstructions, providing the front seat passengers an area to protect themselves in the event of an accident. The engine and transmission were mounted on a separate subframe which was secured with only six bolts. The entire drive train could thus be lowered and removed from the car in minutes. Tucker envisioned loaner engines being quickly swapped in for service in just 30 minutes. Tucker initially tried to develop an innovative engine, with help from Ben Parsons, then owner and president of the Fuelcharger Corporation, and would later be Tucker's VP of engineering. It was a 589 cubic inches (9.65 L) flat-6 cylinder with hemispherical combustion chambers, fuel injection, and overhead valves operated by oil pressure rather than a camshaft. An oil pressure distributor was mounted in line with the ignition distributor and delivered appropriately timed direct oil pressure to open each valve at proper intervals. The oil pressure fed to each valve was "timed" by intake and exhaust eccentrics and measured by spring-loaded plungers. Built of aluminum and magnesium castings with steel-plated cylinder linings, the huge pistons required up to 60 volts to turn over the starter, nearly triple the power of a normal starter. This unique engine was designed to idle at 100 rpm and cruise at 250-1200 rpm through the use of direct-drive torque converters on each driving wheel instead of a transmission. It was designed to produce almost 200 hp (150 kW; 200 PS)1 and 450 lb·ft (610 N·m) of torque at only 1800 RPM. When cruising at 60 mph (97 km/h), it would only turn at approximately 1000 rpm. These features would have been auto industry firsts in 1948, but as engine development proceeded, problems appeared. Six prototypes of the 589 engine were built, but it was installed only in the test chassis and the first prototype. Drew Pearson, one of the top newspaper columnists of his time, reported publicly that the car was a fraud because it could not go backward and it went "goose-geese" going down the road. Despite the fact that this problem was limited to the first prototype only, a symptom of the speed with which the first car was put together, the damage to the car's reputation was done, and a storm of negative media followed. Franklin O-335 engine and Tucker Y-1 transmission. An air-cooled flat-6 engine, the O-335 made by Air Cooled Motors (and originally intended for the Bell 47), fit, and its 166 hp (124 kW; 168 PS) pleased Tucker. He purchased four samples for $5,000 each, and his engineers converted the 334 cubic inches (5,470 cc) engine to water cooling (a decision that has puzzled historians ever since). The Franklin engine was heavily modified by Tucker's engineers, including Eddie Offutt and Tucker's son Preston, Jr. at his Ypsilanti machine shop. Using an aircraft engine in an automotive application required significant modification; thus, very few parts of the original Franklin engine were retained in the final Tucker engine. This durable modification of the engine was tested at maximum power for 150 hours, the equivalent of 18,000 miles (29,000 km), at full throttle. Tucker quickly bought Air Cooled Motors for $1.8 million to secure the engine source, then canceled all of the company's aircraft contracts so its resources could be focused on making automotive engines. This was a significant decision, since at the time of Tucker's purchase, Franklin held over 65% of post-war U.S. aviation engine production contracts. The loss of income was substantial. With the 589 and its torque converters (and no reverse) out, Tucker now needed a transmission to mate with the Franklin O-335. They decided to try adapting designs intended for front-engine/front wheel drive use. The Cord 810/812's 4-speed electro-vacuum manual transmissions fit the design requirements and were used initially. This could not handle the power and torque of the O-335 engine, shearing off the teeth from first gear if the engine was gunned off the line. In an effort to solve this problem, Tucker and his engineers modified it, installing stronger gears and lengthening the case. The modified Cord transmission was named the Tucker Y-1 (Ypsilanti-1) and was installed in most Tuckers. Both used a Bendix electric vacuum shift mechanism, with no mechanical linkage to the steering column shift lever. These versions had problems with electrical connections and vacuum leaks that hindered shifting, so a new design was needed. A Borg-Warner 3-speed automatic was tested and was installed on car #1048, but Tucker ultimately wanted to design his own transmission for the car. Tucker 335 engine and Tuckermatic R-1-2 transmission (trans recovered from car #1042; note second torque converter on the end). To solve the transmission problems with a new design, Warren Rice, creator of the Buick Dynaflow transmission, was consulted. A unique continuously variable transmission called the "Tuckermatic" was designed, which was strong enough to handle the Franklin O-335's power and torque. It was a simple but effective design with double torque converters and only 27 parts, about 90 fewer than normally required for an automatic. The double torque converters allowed a continuously variable drive ratio with only one forward gear and one reverse gear which used the torque converters to vary the transmission ratio based on load and engine speed. Three versions of the Tuckermatic were made, the R-1, R-1-2, and R-3, (R for Warren Rice, its designer). The first version, the R-1, was not installed on any of the final cars. It required the engine to be off in order to select a gear. The R-1-2 was improved by adding a layshaft brake to allow gear selection while the engine was running. This version was installed on cars #1026 and 1042 only. The R-3 version had further improvements including a centrifugal clutch to help shifting between forward and reverse even further, but it was never installed in any of the final cars. Tucker rear suspension rubber torsion tube (left) and Sandwich type front suspension (right) used on cars #1001–1025. Tucker Rubber Torsion Tube (version2) Front Suspension used on car #1026-on. This unit taken from car #1046 for V8 conversion. Suspension designs, especially the front suspension, had to be changed throughout development. Rather than springs, Tucker used an elastomeric (rubber) 4-wheel independent suspension similar to what was used on the race cars he developed with Harry Miller at the Indianapolis 500. The rubber elastomers were developed with assistance from the Firestone Tire Company and used a special Vulcanization process to produce a specific spring rate. Tucker's suspension designs were plagued with severe stiffness throughout development, which, while good for handling, caused front-wheel corner lift when cornering on uneven surfaces. The test bed and the prototype had a double-rubber disc type front and rear suspension, similar to Miller's race cars, which was too weak for the weight of a passenger car. On cars #1001 and 1002 the rear wheels could not be removed without removing the fender or suspension due to the stiffness of the suspension and the rear wheel arch fender design. From car #1003 on, the rear fender shape was changed so the tire could be removed easily. Aside from the fender changes, the rear suspension remained the same from car #1001-on. Three versions of the front suspension were installed in the cars (aside from the rubber-disc style used on the prototype). Cars #1001–1002 used a rubber torsion tube design, which suffered from severe toe-in during heavy braking. Tucker then switched to a rubber sandwich type suspension (with a rubber block sandwiched between the upper and lower A-arms) on cars #1003–1025, however this type was severely stiff. Starting on car #1026, Tucker finally settled on a suspension design with a modified version of the rubber torsion tube with the toe-in braking problem corrected. To prove the road-worthiness of his cars, Tucker and his engineers ran several cars at the Indianapolis Motor Speedway in several endurance tests. During this testing, car #1027 was rolled three times at 95 miles per hour (153 km/h), and the driver (chief mechanic Eddie Offutt) walked away with just bruises. During the crash, the windshield popped out as designed, verifying Tucker's safety features were effective. Afterwards, upon replacing a damaged tire, the car started up and was driven off the track. The prototype was the only complete Tucker with Rubber Disc prototype suspension, the 589 engine, and direct torque converter drive (with no reverse gear). After the first showing it was converted to an O-335/Y-1 at the Tucker factory. Car #1001 was previously owned by David Cammack as part of the Tucker Collection in Alexandria, VA. Upon Cammack's death in 2013 his entire extensive Tucker collection was donated to the AACA museum in Hershey, PA. Fenders changed from 1003-on to allow rear wheel removal. Rubber Torsion tube front suspension plagued by severe toe-in when braking. Car was originally Grey(Silver)/500 but was painted Maroon/600 when it was restored in 1978. Was reportedly entered in two NASCAR races in 1950. Tucker #1007 left the factory in the Green color (#300) with the Green interior(#900) trim. There were only eight Green Tuckers, and only 5 remain in the factory Green color. During the early 1960s, Tucker #1007 was painted a bright red-orange, then later painted black, then lastly painted its present deep metallic blue color in the early 1990s. It is currently on display in the LeMay Family Collection at the Marymount Event Center in Tacoma, WA. Car was originally Beige but is now Maroon/600. It is currently located in The Richard Driehaus Collection at Chicago Vintage Motor Carriage. After 50 years stored in a barn near Tacoma, WA Tucker #1010 was sent to auction in January 2011 via Gooding and Co in Scotsdale, AZ for a starting bid price of $750,000. Reports and photos indicate the engine was seized, with rust damage throughout the vehicle and some minor exterior parts missing, including original hubcaps. Major restoration is necessary. On public display at the La Porte County Historical Society Museum as part of the Kesling Auto Collection. This car was damaged beyond repair in 1953, broadsiding a tree in South Wales, NY. The remnants of the frame are located in Grand Rapids, MI and some body panels are in Roscoe, IL with the owner of Tucker 1027. The engine and Y-1 transmission from #1018 are located at the AACA Museum in Hershey, PA. Accident Remnants The front end sheet metal from car #1018 was used to complete car #1052 in 2015. Painted light blue by its owner in 1959, shortly after purchasing the car. He repainted it again a few years later in a metallic blue shade approximating Waltz Blue, applied to the car on his driveway at night, a flashlight in one hand, the spray-gun in the other! That paint-job remains on the car to this day. Car #1022 was previously owned by David Cammack as part of the Tucker Collection in Alexandria, VA. Upon Cammack's death in 2013 his entire extensive Tucker collection was donated to the AACA museum in Hershey, PA.
Arguably the most valuable Tucker, #1026 is the only remaining complete Tucker with the Tuckermatic transmission. Car #1026 was previously owned by David Cammack as part of the Tucker Collection in Alexandria, VA. Upon Cammack's death in 2013 his entire extensive Tucker collection was donated to the AACA museum in Hershey, PA. From #1026-on the fuel tank was moved to the front of the car and the Rubber Torsion Tube 2 style suspension with improved toe-in was used. Tucker #1025 and below used a mechanical linkage for the Cyclops Eye, whereas #1026 and above used a new, simpler cable design. 1035 was imported to Brazil in 1944, there it was kept in a private collection along with 50 other cars. When the owner died the collection was claimed by several people. The car has since fallen into disrepair and will require restoration. On public display in the wine tasting room at the Francis Ford Coppola Winery in Geyserville (Sonoma County), California. 1038 was, for a time, owned by Bernard Glieberman. It was on display in Shreveport, Louisiana, while Glieberman owned the Shreveport Pirates. Creditors moved to seize the car due to Glieberman's financial problems, and Glieberman's lawyer attempted to steal the car and hide it from authorities, only to run out of gas. Glieberman was eventually allowed to keep the car. The car was sold at auction in August 2006 for $577,500 ($525,000 plus fees) and sold again in August 2008 for $1,017,500 ($925,000 plus fees). After years hidden in Smithsonian storage, Tucker #1039 was finally placed on public display in the Museum of American History in 2011. Tucker #1039 was acquired by the Smithsonian through the U.S. Marshals Service which had previously seized the car in a 1992 narcotics arrest. Instead of selling the car, the U.S. Marshals Service decided to donate the car to the Smithsonian. Currently on loan as of February 2012. #1042 was sold at the Tucker auction without an engine. Rumors exist that it was used in a "Bash a Tucker" fundraiser in the 1950s or may have been hauled off from its storage location by a disgruntled renter. Its location was unknown until 1960 when it was reportedly found abandoned along the banks of the Mississippi River in Memphis, TN, totally destroyed. A Memphis policeman took possession of the remains, but they were later stolen from his property. Most of the Tuckermatic transmission was found and is currently located at the AACA Museum in Hershey, PA. This car was converted to a front-engine Oldsmobile drive train in the 1950s by Nick Jenin for his daughter. It was converted again in the 1960s to a 1964 Mercury Monterey chassis with 390 CID front engine. Sold on eBay for $202,700 (8/20/07) and reportedly returned to original specifications, including a correct Tucker engine. Lowest mileage Tucker with 0.4 miles on the odometer. Tucker 1051 was not completed at the Tucker factory, so it is not technically considered one of the original 51 cars (prototype + 50). The car was purchased at the Tucker auction in an incomplete state, and was finished in the late 1980s using leftover Tucker parts and fiberglass replica doors. The chassis used to complete #1051 is actually numbered #1054. Tucker 1052 was not completed at the Tucker factory, so it is also not technically considered one of the original 51 cars (prototype + 50). #1052 was a test chassis used at the factory for testing automatic transmission designs. The car consisted of only the chassis, driveline and suspension, dash and seats. The car was completed in 2015 by Tucker Enthusiast John Schuler using NOS (New Old Stock) parts he collected over many years, along with front sheetmetal sourced from car #1018. Reproduction floorpans, roof and rear doors were used. The chassis of car #1054 may have been used to complete car #1051. #1057 was the prototype being worked on by Tucker designer Alex Tremulis for the 1949 model year. It was one of eight incomplete body shells (believed to be #1051-1058) left on the assembly line at the time the Tucker plant was closed. Photos from the factory show #1057 was being built with a "wrap around rear window" as one of the 1949 year design changes and is the only 1949 model. But #1057 was later converted to a convertible, whether at the factory or later is unknown. 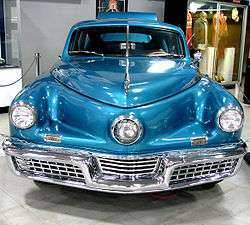 In 1997, Rob Ida Automotive started work on a replica of the Tucker '48 Sedan, which culminated in the release and marketing of the 2001 Ida Automotive New Tucker '48. This replica faithfully recreates the Tucker's external bodywork, but is built on a hotrod chassis with resin-infused plastic body panels. The paint and wheels reflect modern hotrod styling, and the interior is fully modern. It is powered by a mid-mounted Cadillac Northstar V8. Claimed performance is 0–60 in 7 seconds, with a top speed in excess of 120 mph (190 km/h). Ida has built three cars. Several Tuckers were entered in the NASCAR Grand National series in the 1950s. An example dealership, costing eight thousand dollars, was Amentini Motors in Cleveland, Ohio. 1 2 3 4 5 "The 1948 Tucker: Specifications". The Showroom of Automotive History. The Henry Ford. Retrieved February 10, 2012. 1 2 3 4 5 6 http://www.lemaymarymount.org/vintage-car-collection.htm. ↑ "Tucker History: Fact Sheet". Tucker Automobile Club of America. Archived from the original on June 8, 2011. Retrieved June 1, 2011. ↑ "Car of the Future". San Antonio Light. February 11, 1946. p. 5. ↑ "Torpedo Car Will Be Made in Chicago". Traverse City Record-Eagle. United Press International. February 11, 1946. p. 2. 1 2 3 Egan, Philip S. (1989). Design and Destiny: The Making of the Tucker Automobile (1st ed.). Orange, CA: On the Mark. ISBN 978-0-924321-00-9. ↑ "Tucker Acquitted of Fraud; Wants to Build Autos". Jacksonville Daily Journal. January 24, 1950. p. 1. ↑ "Fantastic Tucker Story". Waukesha Daily Freeman. June 29, 1949. p. 8. 1 2 3 4 Flory, J. "Kelly", Jr. (2008). American Cars, 1946–1959: Every Model, Year by Year. Jefferson, NC: McFarland. pp. 855, 1013–1015. ISBN 978-0-7864-3229-5. ↑ "Directory Index: Tucker/album/album". Oldcarbrochures.com. Retrieved May 27, 2012. ↑ Duchene, Paul (February 1, 2011). "11 things you didn't know about the Tucker '48". Chicago Tribune. Retrieved February 10, 2012. ↑ Van Riper, A. Bowdoin (2011). A Biographical Encyclopedia of Scientists and Inventors in American Film and TV since 1930. Lanham, MD: Scarecrow Press. pp. 235–237. ISBN 0-8108-8128-4. 1 2 3 4 5 6 Wipff, John (1978). The Compleat History of Corvair, Vol 1, Chapter 2 Tucker and Corvair - Two of a kind?. Shelburne Falls, MA: Clark's Corvair, Inc. pp. 12–14. 1 2 Duchene, Paul (February 1, 2011). "Preston Tucker: The Man behind the Car". Chicago Tribune. Retrieved February 10, 2012. ↑ Mitten, Ray (January 24, 1948). "Tucker Fights Republic for Steel Plant". The Pittsburgh Press. Retrieved February 10, 2012. 1 2 Burgess-Wise, David (1977). Ward, Ian, ed. The World of Automobiles: An Illustrated Encyclopedia of the Motor Car (Reference ed.). Milwaukee: Purnell Reference. p. 2386. ISBN 978-0-8393-6009-4. ↑ Auto editors of Consumer Guide (2002). Cars of the Fascinating '40s: A Decade of Challenges and Changes. Lincolnwood, IL: Publications International. pp. 264–265. ISBN 0-7853-6274-6. 1 2 Ash, Agnes (May 8, 1960). "The Car Arrived Before Its Time". The Miami News. ↑ "Lot 246 1948 Tucker 48 4Dr Sedan". RM Auctions. Retrieved February 10, 2012. ↑ "Barrett-Jackson Lot 5008: 1948 Tucker Torpedo". Barrett-Jackson Auction Company. Retrieved February 10, 2012. ↑ "Gooding's Pebble Beach 2014 Auction". Gooding and Company. Retrieved December 1, 2014. 1 2 3 4 "The Last Tucker Assembled from Original Parts". Retrieved July 30, 2015. ↑ Tobas, Daniel. "The Great Tucker Caper (Or: Glieberman Schlepped Here!)". Archived from the original on February 8, 2001. Retrieved June 29, 2011. ↑ "Tucker automobile". America on the Move Collection. National Museum of American History. Retrieved February 10, 2012. ↑ Matras, John (July 2001). "Ida Automotive New Tucker 48". Car and Driver. Retrieved February 10, 2012. Wikimedia Commons has media related to Tucker vehicles.